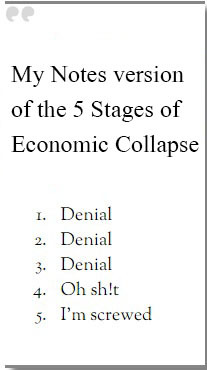 Society as we know is breaking down and collapses in a five stage process outlined here. While it can be accelerated by certain events like war, a natural disaster, pandemic, terrorist attack, or even an impending asteroid impact, history has shown that economic collapse will essentially happen in this five stage process. To survive the collapse, it is important to read and interpret the signs and understand what assets are important to the current situation so you can be prepared for the worst thereby allowing you to survive intact and with as little damage as possible. Ready or Not? A Total Breakdown of Society is Closer Than You Think! A good listen. Bought the book…. What day is that hurricane you are prepping for going to hit? Don’t know, but history tells you that one will? Maybe you should look further back in history and see what else you should be prepping for! Marie: I said folks tossed their long term dehydrated large #10 canned foods. They donated to food banks mostly, not the store bought everyday stuff like canned meats and soups, etc. that people buy when grocery shopping. Long term foods like mt. house, etc. are high in sodium and taste awful. People just can’t quit their jobs and ditch out of cities either so this is why some won’t listen or believe things are dicey. They want more precise info. and I cannot ref. them to a website to help them. Predictions were made in the past by many talk shows and websites and much did not happen. LauraM, you think y2k was a joke? Look at the police-state preparations that were made in advance of that, which are still in place (like the NYPD bunker with cameras out on the streets, to monitor the crowds). Don’t know of ANY cases where “stuff was thrown out after the y2k thing and much money wasted.” I had lots of food stored for y2k and when January 1 rolled around… I just ate it. Would you feel better if nobody had prepared for y2k and then all hell broke lose? If not, I don’t see your point. You want a timeline? You’ll have to ask Almighty God, seriously. What do you think we are? Jim W: Anything is possible I agree. I went out today and got cans of salmon and sardines, canned beans and other veggies and protein powder mixes. We do have hurricanes that can knock out power. I stock up on stuff you get at the grocers not this crap they call long term food storage which many tossed out after y2k because of the awful taste, instead of eating it up. Me and friends want a damn timeline so we can get rid of city property/houses and cash ’em out. I refuse to support any website/radio shows because they are not precise on what they say/are never accurate/have no timeline..
You just need to move in next to the guy who has prepared everything and you just need to have more guns and ammo then he does. LOL!!! Movin out to the Hooterite Farm. just down the road. Ha were already there! Laura – If I told you it would happen tomorrow, what would you do? Go out and buy another can of tuna? Ask the people of Germany. It never happened there, until it did. And then it was too late. I’ve heard this since the ’80’s, books were written and speakers conferences back then, no computers or internet. Short wave radio talk shows were informing. I need a timeline as to when this will happen, friends will quit their jobs and ditch out to the country on relatives land or their land. None of these type articles are precise and detailed, y2k was a joke, and people refuse now to listed and prepare as stuff was thrown out after the y2k thing and much money wasted. Folks need a damn timeline! You want a time line Laura M. Rabbi Ben Samuel said Israel will not make it past 2017. Also, by comparing two Masonic Authors, Manly P. Hall “The Secret Destiny of America” and Paul Foster Case “The Great Seal of the United States of America”, we learn that 13 x 21 = 273. 1776 + 273 = 2049. The singularity is to be reached in 2045, 3.5 years before 2049. Mans dates. Also, (biblical generations being 120, 70 and jubilees 50 years) 120 years + 1947 equals 2067, and 50 + 2017 = 2067. There are blood moons 3.5 years before 2067 and 3.5 years before 2037 or 1967 + 70. Also, Kent Hovind tells us that Jesus comes back in 2028. There is a timeline for you. Hope that helps. The truth is this, even if Jesus does not come back soon, our country has been taken over by communist, there will be a war as described by William Guy Carr in 1958 in the introduction to his book “Pawns In The Game”, between the muslims and the christians/jews.